Reception: September 4, 2015 | 5:00 – 9:00 p.m.
Fernand founded and directs the visiting artist program at Shared Space Studio in Pentwater, MI, and teaches part-time at Kendall College of Art & Design Continuing Ed Department and Cook Arts Center in Grand Rapids. She received her BFA from Pacific Northwest College of Art in 2006, her work has been shown across the country, and she is often traveling to participate in artist residencies and guest-teach. 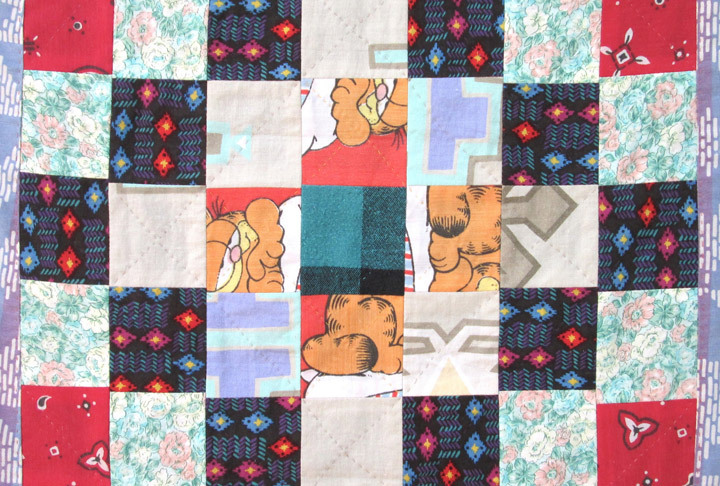 Image: Detail of Strange Banner Sunshine & Shadow, 2013, repurposed fabric, machine-pieced & hand-quilted, 18 x 62 inches. Image courtesy the artist. This exhibition is partially supported by the Doubletree, which will provide the artist with a complimentary room during her installation.